Update: This is an older article that I have slightly edited. It wasn't my intent to republish it, so my apologies to anyone who got an alert who read this when it was originally written. Below I Fisk an article titled How to get to a fully renewable power system. It's largely an anti-nuclear article in sheep's clothing. Anti-nuclear environmentalists are becoming as much of a stumbling block to low carbon energy as the head-in-the-hole conservatives. They were taught as impressionable adolescents that nuclear energy was evil and they just can't unlearn it. As a father of two, it pisses me off frustrates me that attempts to protect our children from the ravages of a warmed world are being hampered by adolescent imprinting--on two fronts. Predictably I suppose, tribe identity (and the defense of the markers that define your tribe) tends to trump rational thought. Thanks to the Internet, the old anti-nuclear arguments are in a shambles. It's interesting to watch new ones trying to evolve. The very latest is to claim that the world's power grids don't need baseload power ...plants (or something fuzzy like that). Admittedly, Dave does a pretty thorough job of laying out what it would take to get a fully renewable power system. First, you have to temporarily increase the number of natural gas power plants (and hope those who invested in them will later give them up peacefully and in a timely manner). ...the crap out of renewables. The more renewable sources there are on the grid, the wider the geographic area they cover, the more every region has maximized its local, distributed resources, the steadier the total supply is. That's especially true if you ramp up hydro, geothermal, and biomass, i.e., non-intermittent renewables. ...you can shrink the peaks (nerdspeak: "peak leveling") by moving demand around (nerdspeak: "demand response"), either by persuading people to spread their consumption out by charging more during peak hours (nerdspeak: "variable pricing"), or by building appliances that can cut back automatically. Oh, and one more thing. You have to get rid of "nukes." As a thought exercise about how to get to all renewable energy it makes sense you would exclude nuclear power simply because it is not renewable (although natural gas isn't renewable either). He dropped the ball (and raised my ire) when he suggested that we should drop nuclear because it is centralized and provides baseload. But there is nothing inherently wrong with centralized baseload power plants. So, summing it all up, what he's actually saying in a very roundabout way is that we must stop using nuclear because it will reduce how much renewable energy we will need. If we really knew for sure that we could replace all electricity production with renewables I'd have no quibble. But we don't know that, not by a long shot. He wants us to dump a known economically feasible zero carbon energy source and bet our children's futures on an untested hypothesis (of unknown cost) that we can keep the lights on coast to coast, rain or shine, day and night by stringing together a Rube Goldberg collection of variable, intermittent and/or non-dispatchable renewable sources without any help from "nukes." This argument might carry more weight if the overarching priority is to use only renewable energy. But that isn't the overarching priority. Eliminating the burning of fossil fuels is the overarching priority (because they are the main source of green house gases). Renewable may be the ultimate goal but it is not the more immediate one. The lion's share of renewable energy is either centralized (wind and solar farms, hydro, etc) and/or baseload (hydroelectric, geothermal, biogas, biomass, solar thermal with storage). For example, burning biomass in place of or along with coal is centralized baseload power (that may be partially renewable, but is probably not low carbon and certainly is not clean). Read the following to see how convoluted the reasoning can get. There are three basic power generation modes: baseload (full throttle all the time), load following (variable output), and peaking (off or on—binary). Some gas fired power plants may turn off some of their turbines instead of all of them to provide a measure of load following as well (throttle back). One out of three of the main modes of power generation is missing from Dave’s plan to get to “a fully renewable power system.” What are the odds of getting an accurate answer when a third of your input data is missing? The goal is to eliminate coal, period. Unlike coal, nuclear baseload power produces no emissions, levels no mountain tops, has no railroad tracks jammed with thousands of carloads of coal, and fills in no river valleys with mine tailings (i.e., coal and nuclear share almost nothing in common other than economics). Most renewable energy produced today is coming from centralized baseload power sources (hydroelectric, geothermal, biogas, biomass, solar thermal with storage). And although wind and solar photovoltaic farms are not baseload, they most certainly are centralized power plants. Confused? I don’t blame you. He appears to be saying that we must eliminate power sources that run continually (baseload) unless they are renewable (hydroelectric, geothermal, biogas, biomass, solar thermal with storage) or made to act like a single baseload power plant by stringing together a conglomeration of intermittent sources with a hypothetical, untested, super smart grid of unknown configuration and cost (HVDC, superconducting, conventional high voltage wire). There is a propensity for us enviro types to favor distributed energy even though most renewable energy comes from centralized power plants. We don't like the term "power plant" because they are run by the man. But like it or not the man is in charge of solar and wind farms as well. And even though the one main advantage of distributed is that you don't need a gargantuan coast to coast grid, we acknowledge the need for some kind of new coast to coast grid to tie it all together. Contradictory and schizophrenic are two words that come to mind. In the comment field of the article I'm critiquing you will find those who have not only confused baseload with centralized power but have also been convinced that both are bad, even though wind and solar farms are both examples of centralized power and to ice the cake, both can (as Dave points out in his chart) serve as baseload if enough can be strung together with tens of thousands of miles of power lines. Here he suggests to readers that a nuclear plant can only alter power output (“ramping up and down”) by turning off and on. Imagine if cars had only two modes like a rocket ship—full throttle and off. Nuclear plants can’t be used as peaking power plants like the gas fired variety that often actually do turn on and off. However, some nuclear designs (like those in France) can ramp up and down like your car engine does and are often used for load following. Although it tends to be more economical to design nuclear power plants for baseload, some designs are capable of load following as well and if there is enough economic incentive to do so (to support renewables for example) they can be designed specifically for that purpose. The above sentences are accurate once you remove his suggestion that this is false conventional wisdom and that the problem is with the peg board filled with round holes, not the square pegs (wind and solar) you are trying to jam into it. “…When I was in Germany recently, though, the reaction among folks I talked to was, 'Yes, that is a problem. We are going to solve it!'..." You would of course get the same reactions here as well depending on how selective you are about who you talk to. There are lots of ways to solve the problem, like burn fossil fuel gas in peaker plants and nuclear in baseload and load following plants to maximize how much wind and solar you can effectively use. And yes, you could also try to string together a gargantuan super grid from sea to shining sea but that isn’t likely to be the highest probability for success. In a nutshell, Dave is biasing the data to get the result he wants, which is that we don’t need “nukes” as he calls nuclear power plants (a term originally used to denote nuclear weapons, which have nothing to do with nuclear generated electricity). The conflation of thermonuclear devices with peaceful electricity generation is as manipulative as it is disingenuous. I try to point this out every time I see it no matter how subtle the conflation. Just last night I watched the documentary Trinity and Beyond (narrated by former Starship captain, William Shatner). It was unsettling to watch the detonation of one thermonuclear weapon after another. 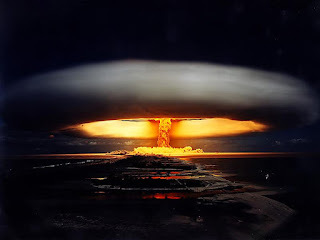 The sight of the Russian 57 megaton thermonuclear device going off raised the hair on the back of my neck. The United States alone detonated over 330 nuclear weapons (submerged in the ocean, buried underground, shot from canons, launched into space, you name it). The realization that all of the nuclear powers were repeatedly releasing all of that radiation into the environment is sobering but at the same time it puts into perspective just how out of perspective the public’s concerns are over radiation from nuclear power plants. Ironically, Germany also features very prominently in the film Trinity and Beyond. Nuclear weapons were developed as a result of Germany leading the world into the worst conflagration in all of human history. Maybe this “eschewing of nukes” is a form of subconscious societal guilt relief for the sins of their fathers. Time will tell how successful they will be. Odds are good that they will end up burning more fossil fuels as well as importing more energy (which is actually fine as long as it is low carbon energy). Certainly, George Monbiot sees their solar program as a form of robbing the poor to subsidize the rich. I also find it ironic that their neighbor, France, gets almost 80 percent of their electricity from nuclear. Such a stark contrast this will be. ...none of these scenarios discussed in the previous section would result in any net reduction in carbon emissions, as each would simply see renewables and/or efficiency displace Germany's existing nuclear plants, a zero-carbon energy source, rather than coal or natural gas-fired power plants. I wonder why you are so irrate and pissed off about this other guy saying you don't need nuke plants to keep the juice flowing. Proof of it is to be found in my own life, since I get 100% renewable sourced electrons piped to my home's main electrical cabinet, supplied by my cooperative utility EcoPower cvba, and this since 2004. They have now 39 000 'members', feeding 103 000 peoples. Each member owns at least one 250 euro share of this cooperative, used to invest in power projects. To bring my electricity and home heating bill to zero, I also have put solar PV panels on my home's roof. Their yearly production covers my daily and nightly electricity consumption, and my winter home heating needs, measured over a year. Multiply this approach by (b) millions of people doing the same (switching to 100% renewable electricity suppliers) and the MARKET will force the monopolies to change their current cozy, government approved powergen setups. After all, there are ZERO nuclear plants built in the world on 100% private capital, since ALL benefited substantially from government assistance, in the form of low government backed preferentiam intrest rates, R&D support, preferential fixed electricity rates, long term guaranteed power take off, and plant decommissioning and nuclear wastes storage costs forced onto Joe Public. So you can have your yellow cake and eat it too, I prefer my current arrangement. My bad Alain. This is an older article that I inadvertently republished, although it is still pertinent. I am at a loss as to why you think the issue is nuclear verses solar. Our future energy mix will have both. It can't all be solar or all nuclear. Your current arrangement is wholly dependent on being connected to a grid that uses other sources when your solar isn't working. You don't get 100% renewable piped to your home. That is impossible to do. "...there are ZERO nuclear plants built in the world on 100% private capital..."
How much government money went into your solar panels? Nuclear plant decommissioning and storage costs have all been paid for already by small surcharges on electric bills. The grid your solar depends on is owned and operated by these monopolies you are railing against. Ecopower cvba operates as a cooperative under Belgian law for financing renewable energy projects. The Company produces and distributes green electricity and warmth through wind turbines and hydroelectric plants. So I assume that most of the power is coming from Hydroelectric. That is the best scenario of such power and Belgium is such a tiny country compared to the US or UK. It would be cheaper just to have hydro power backed up by coal or nuclear, less infrastructure cost and more usable EOL time. The sites for hydro power are limited, especially for the US, and many enviros don't want it. And windmills are large bird cuisines.